Great Living Smart Investment RESIDENTIAL LUXURY: We are building twelve exclusive design villas with private pools only a short walk, 1km from the beach. This development concept is a gated community with three and four bedroom modern luxury design villas. This villa enjoyes a magnifizent 60m2 Roof terrace with stunning views over the mediterenian sea. In each floor of the villa there is a seamless connection with the indoor and outdoor areas. The mainfloor consist of kitchen and livingroom with specious and open areas. 1 of the 3 bedrooms are located in the mainfloor. The upper floor has a large master suite of 32.6m2 with en-suite bath and large wardrobe area. with direct access to a terrace with stunnning seaviews This villa has underground parking for 2 cars and a large basement with room for a Gym, TV and gaming room. Private pool Sea, mountain and golf views Southwest orientation Quiet residential area within walking distance of the beach, local shops and restaurants Only a twenty five minute drive from Malaga airport and a fifteen minute drive from Marbella This exclusive development consist of 3 different villa consepts: The villas have been positioned carefully on the plot to ensure extensive views from both indoor and outdoor areas. At the same time the design and direction of the villas gives good private spaces on terraces and pool areas. All villas have spacious terraces with private pools and sub tropical garden features. A great place to live Riviera del Sol sits on the Costa del Sol in Southern Spain midway between Marbella and Fuengirola. Riviera del Sol is situated only a few minutes from the AP7 motorway access, and the national coast road the A7 (formerly the N-340), allowing easy access to Malaga airport in 25 minutes. Riviera del Sol is a mixed residential and holiday area enjoying all the facilities and services needed to enjoy life comfortably. Banks, restaurants, shops, supermarkets, chemists and a health centre located in the neighbourhood. The number two and three holes of the Miraflores golf club are literally a wedge away. A short hop in the car eastward and you find La Cala village, Miramar shopping mall, Fuengirola town centre and the city of Malaga. Go west and you will discover exclusive beach clubs, La Cañada shopping mall, Marbella town centre and Puerto Banus. A day trip into the country takes you to breathtaking Ronda (a favourite of Orson Wells and Ernest Hemingway), Seville, Granada and even to Sierra Nevada’s picturesque ski resort Monachil. The coast is also a paradise for anyone who loves outdoor activities with beautiful mountain ranges for trails and hiking, on and off road bicycling, all sorts of water sports, tennis, not least more than 70 golf courses to choose from, and much, much more. You don’t want to leave We have designed our villas to offer only the best in luxury, comfort and modern design. Each villa is developed around large expanses of glass windows, sliding and folding glass doors to seamlessly connect the indoor and outdoor areas. 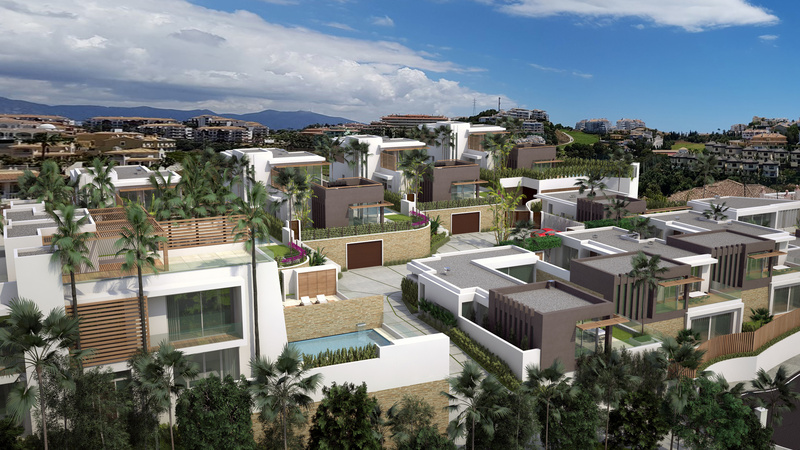 The villas have tailored gardens and terraces with private pools and water features. Each bedroom with en-suite bathroom, modern kitchens with pantry, porcelain floors, wall tiles and much more.